San Diego Self Storage (SDSS) participated in the 7th Annual Kure It Cancer Research, Cruise for a Kure. 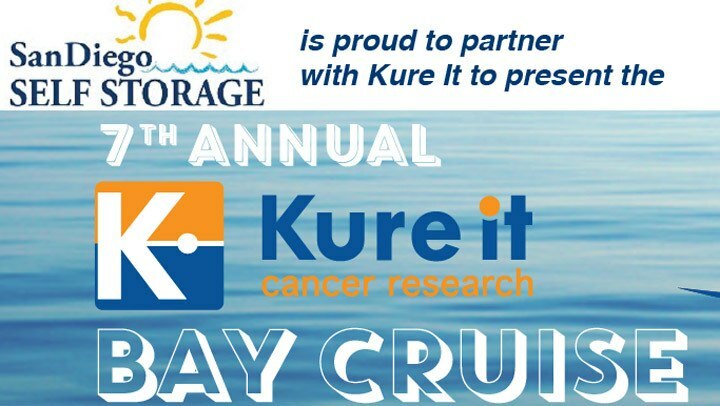 Every year during the California Self Storage Association (CSSA) Owner’s Summit, Kure It Cancer Research partners with the CSSA to end the summit with a charitable Cruise for a Kure! Over 150 CSSA members and Self Storage executives boarded the 128’ Mega-Yacht, The Ambassador, to cruise the Newport Bay at sunset and support Kure It Cancer Research. Kure It Cancer Research is a nonprofit dedicated to providing direct and immediate funding to support the brightest minds in translational research for underfunded cancers at leading cancer centers. San Diego Self Storage was a proud sponsor of the 2015 Kure It Cancer Research Cruise for a Kure, sponsoring a casino table for $2,500. “We were privileged to participate in the 7th Annual Cruise for a Kure. We proudly support the efforts of Kure It Cancer Research and the progress they are making to end this deadly disease. SDSS is a locally owned company that takes great pride in giving back to the community, and to organizations which are making a positive impact,” said SDSS Managing Partner, J. Terry Aston. In 2014, members of the CSSA, including San Diego Self Storage, donated nearly $100,000 to Kure It Cancer Research. In June of 2015, Kure It Cancer Research donated $100,000 in the name of the CSSA to fund a pediatric brain cancer research project at the UCSF Helen Diller Family Comprehensive Cancer Center. The Diller Family CCC was so pleased with Kure It’s donation that they matched the grant and extended the research project from one year to two, doubling the impact of the CSSA’s donations. This year, due to the amazing support of the CSSA through 2015’s Bocce for a Kure event in Napa and the recent 2015 Cruise for a Kure in Newport, donations currently exceed $100,000. Kure It Cancer Research has begun to search for its next 2016 CSSA grant recipient and San Diego Self Storage is pleased to have the opportunity to contribute to this worthwhile cause. Kure It is a non-profit organization providing funding for innovative research projects focused on kidney cancer and other underfunded cancers. The funds raised through Kure It directly support groundbreaking research at leading cancer centers. Since being established in 2007, Kure It has raised $2 million and supported research across the United States. http://www.kureit.org About San Diego Self Storage Founded in 1972, San Diego Self Storage is one of the largest self-storage providers in San Diego County with a network of 17 neighborhood self-storage facilities and additional facilities in Los Angeles and Orange County. The company offers small personal units and multiple larger units for commercial accounts. In addition, San Diego Self Storage offers a unique “1st Year Price Guarantee” along with discounts to active militarily personnel and their families, as well as senior citizens. For further information, call (858) 909-0090 or visit http://www.SanDiegoSelfStorage.com.